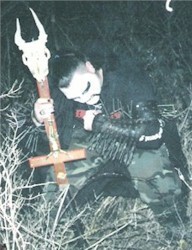 BURNING WINDS is a highly productive solo Black Metal concern of one Necrodan, owner of Necromantic Productions and also operational with FIRST OF THE FALLEN. The BURNING WINDS project first revealed itself with an eponymous demo tape in 1999, limited to just 66 copies before sharing a split album 'Aptheosis Of War' that same year with Dutch act KERBEROS through Goat Productions. Subsequent demos ensued from 2001 and on. About 5 demos were released after the year 2000. Xeroxed covers and recorded onto regular non studio tapes.